American primitive guitar is a fingerstyle guitar music genre which was first originated by John Fahey in the late 1950s/early 1960s. Although increasingly confused in recent years, American primitive guitar is distinct and different from American primitivism, which refers to certain painting and sculptural art forms which arose in the 1890s. 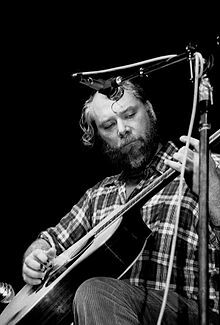 American primitive guitar began when John Fahey first composed and recorded avant-garde/neo-classical compositions using traditional country blues fingerpicking techniques, which had previously been used primarily to accompany vocals. Fahey was joined in the genre by Leo Kottke, Bob Hadley and Peter Lang throughout the 1960s and 1970s, all of whom played at one time or another on Fahey's Takoma Records label along with uncategorizable artists such as Robbie Basho. In recent years, some of the musicians who had played American primitive guitar have integrated new-age guitar techniques and have come to be broadly categorized into the New Acoustic genre. Possibly because Windham Hill Records founder William Ackerman's influences included Fahey, Basho, and Kottke, critics began to mistakenly associate Fahey with new-age music. Fahey himself rejected any influence upon or responsibility for the genre, referring to it derisively as "hot tub music" and feeling that any such association with New Age meant that he had failed as an artist. ". . . The New Age people call it Folk; the Folk people call it New Age, but it is really neither. It's transitional. The style is derived from the country blues and string band music of the '20s and '30s, however much of the music is contemporary. Fahey referred to it as 'American Primitive' after the 'French Primitive' painters, meaning untutored." "...Fahey suggested the idea of joining similar themes, and exploring both time and space. He also wanted me to try using dissonance and minor tunings. Maybe the biggest thing he put into me was the idea that a major part of music exists in the space between notes and chords." ^ a b c d e f g "A Celebration of John Fahey and American-Primitive Guitar". The New Yorker. Retrieved 2018-09-03. ^ "Peter Lang on American Primitive Guitar". Archived from the original on 28 September 2007. Retrieved 2007-09-27. ^ "Peter Lang on Fahey's influence on his playing". Archived from the original on 12 September 2007. Retrieved 2007-09-27. The Cosmos Club. American primitive guitar. Washington City Paper. This page was last edited on 2 March 2019, at 06:25 (UTC).